John Potter Cook was one of the founders of Hillsdale, Michigan and its most prominent citizen. After the death of his wife, Betsy, he married her sister Martha. The couple had nine children, in addition to the five from the first marriage. Among the brood was William Wilson Cook, born on April 16, 1858. William Cook’s life was one of privilege mixed with stern Victorian morals. From his father he learned temperance and the four critical rules to achieving success: economy, industry, morality and virtue. His mother instilled in him that the home was “the safety of the nation.” These concepts would be deeply-rooted in Cook for life. In 1882 Cook graduated from the University of Michigan Law School. Before long he moved to New York where he started his law practice. When he acquired the millionaire John W. Mackay as a client, his practice would soar. Mackay, who had made his fortune in Nevada silver mining, was outraged at the high rates for telegraph and cable services charged by Western Union—a monopoly owned by Jay Gould. To break the monopoly Mackay partnered with publisher James Gordon Bennett and began acquiring small, struggling businesses. The companies were merged into corporations capable of competing. William W. Cook was the attorney for the ventures and he quickly became one of the nation’s leading experts on corporate law. His financial success was augmented when, in the early 1890s, he was part of a group that purchased all the Detroit street railways, converting them from horse-drawn to electrically powered. He also invested in Cuba’s railroads and sugar industry. In 1889 Cook had married Ida Olmstead, the daughter of eminent New York City attorney Dwight Hinckley Olmstead. It was a tumultuous marriage and the couple separated several times. Finally, in 1898 Ida packed her bags and left for good, going to North Dakota where she filed for divorce claiming desertion. She was dealing with one of the nation’s most astute lawyers, however, and Cook responded by counterclaiming desertion on her part. The divorce was granted, providing Ida with neither alimony nor division of property. All the while, despite his growing fortune and reputation, Cook had never purchased a home. He continued to rent in a boarding house while he began accumulating property in Port Chester, New York along the border of Connecticut. Before long he had early 100 acres that he transformed into an arboretum, planting rhododendrons and several species of evergreens, overseen by a full-time groundskeeper. In 1910 the 58-year old Cook was ready to settle in to his own home in Manhattan. By the 1880s impressive mansions had begun lining 5th Avenue across from Central Park, approaching the Lenox Library that was built in 1877 extending from 70th to 71st Street. But when the Lenox Library became part of the New York Public Library, the trustees decided to sell the entire block for development—with the stipulation that only private homes could be built there until 1929. Steel tycoon Henry C. Frick purchased the block front on 5th Avenue to erect his mansion which would not be completed until 1914. Directly behind the Frick property, William Cook purchased the lot at No. 14 East 71st Street—buffered by a 50-foot strip of land that Frick bought up to protect his privacy and security. Millionaires moved quickly. 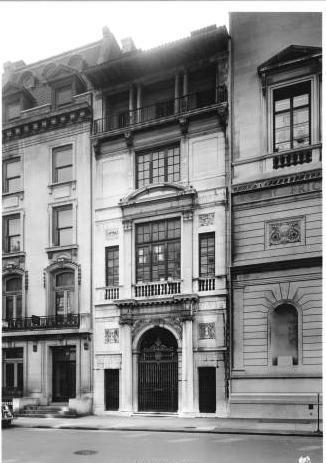 On April 9, 1910 The New York Times reported that C. W. Luyster, Jr. would “commence building at once” two 25-foot residences on the south side of East 71st Street, adjoining the property of William W. Cook. The same article mentioned another sale on the block to F. W. Jones, Jr.
A year later in May, architects York & Sawyer filed plans for Cook’s new home. The New York Times announced “The façade will be of brick and marble, with a terra cotta tiled roof. It will be in the modern French Renaissance style of architecture, with massive copper grilled entrance doors.” The architects estimated the cost at $75,000. By the time Cook’s mansion was completed, the block was completely filled with the exception of 157.6 feet. His neighbors included C. C. Auchincloss, R. A. Chesebrough, C. W. Luyster, Mrs. H. P. Brookman, William T. Hyde,, J. C. Moore, A. W. Krech, Dave H. Morris, James B. Clemens, and, of course, Henry C. Frick. Edward York and Philip Sawyer had produced for the attorney a magnificent limestone mansion unlike any other on the block. The third floor was dominated by an expansive, multi-paned window framed by fluted pilasters and topped by an arched pediment that overlapped onto the fourth floor. A charming open loggia at the fifth floor was sheltered by a deeply-overhanging cornice. The home was entered through two-story entrance with massive bronze gates. The service entrance was balanced by a matching grilled window. The architects commissioned sculptor Atilio Piccirilli to execute the carvings and master iron worker Samuel Yellin to create the balcony railing. The loggia featured an arched, tiled ceiling by the renowned Rafael Guastavino. William W. Cook did not play the piano. But his “very fine friend” was the opera singer Isabel Hauser. Cook’s niece later remembered that the family maintained that the piano was purchased for her. Cook detested artificial music and refused to have a phonograph in the house and the attractive singer played and sang for his guests. Then suddenly on December 6, 1915 the soprano canceled a performance scheduled for December 10th due to illness. Tragically she died at home the following day at 1:30 p.m.. Her physician, Thomas King, reported the cause of death as peritonitis. Cook’s niece later recalled that the attorney was so grief-stricken that the family feared for his life. He went on to donate the Lawyers Club, dedicated in 1925, which included residential rooms, a large lounge and a dining room. He then worked with York & Sawyer again, on plans for another dormitory and the Legal Research Building (a law library). By now Cook had built his country get-away on his Port Chester property. No longer the hale young attorney who had taken on Jay Gould’s monopoly over four decades earlier, he was reclusive, depressed and suffering from tuberculosis. Cook wrote out his last will and testament. In it provided stocks and relatively small amounts of money to his family, $5,000 each to his physician and nurse, and other token amounts to servants and organizations. But essentially the entire estate of $12 million, a figure that would amount to about $260 million today, was bequeathed to the University of Michigan. A separate paragraph specified that the beloved Steinway piano and the tapestries were to go into the Martha Cook Building. In 1929, with failing health, Cook was spending less time in the city and more and more time at his country estate. He had his personal library from the 71st Street house dismantled. 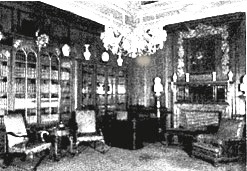 The exquisite paneled room was reassembled in Ann Arbor along with his extensive library of legal volumes. On June 3, 1930 Cook’s illness had dramatically worsened. A cot was brought in to the dining room of the Port Chester house where he was attended to. The following day, surrounded by the park-like beautify of his gardens and exotic plantings, he died. Cook had already donated over $8 million to the Universtiy of Michigan; but suddenly the institution was much more financially secure. Even before the probate inventory of the 71st Street house could be pulled together, the piano and the tapestries were spirited away to Michigan. And then, from out of the woodwork, appeared Ida Olmstead Cook. The court case dragged on with high-powered attorneys battling for eight months. Finally a settlement was reached in December. Ida, who was also suffering from advanced tuberculosis, agreed to receive around $200,000 from the University. While the $12 million was useful for building and enlarging the Law School in Michigan, the university now had to decide what to do with No. 14 East 71st Street. The school wrestled with ideas on how to use the building without paying taxes on it. For a short time it considered converting the town house to an alumni club, but the idea never got off the ground. Finally, in November 1942 the Board of Regents resolved to sell the home for $17,500. The house was converted to offices by The Viking Fund, Inc., a foundation for scientific, charitable and educational purposes. In 1951 The Wenner-Gren Foundation for Anthropological Research, Inc. took over the Cook house. The foundation was established to support anthropological research and to create an international community of research scholars. The Foundation stayed on in the mansion until 1980. In 1992 William W. Cook’s magnificent home was reconverted into a single family home; its exterior unchanged since the millionaire attorney first walked through the massive bronze gates in 1913. Many thanks to Margaret A. Leary, Librarian Emerita of the Michigan Law School and author of "Giving it All Away: The Story of William W. Cook and his Michigan Law Quadrangle" for her invaluable help and information. Thank you for your efforts in preserving this history. As a former resident of the Martha Cook Building, I share a deep appreciation for Cook's commitment to our university.